I managed to design five new Christmas projects this year. You've seen my apron and oven mitt/trivet set. Then there are some ornaments and a cutlery holder which I'll show you some time. For all of them I decided to stick with traditional red and green this year after diverting to something quite different last year. There is something just so right about the red and green combination. 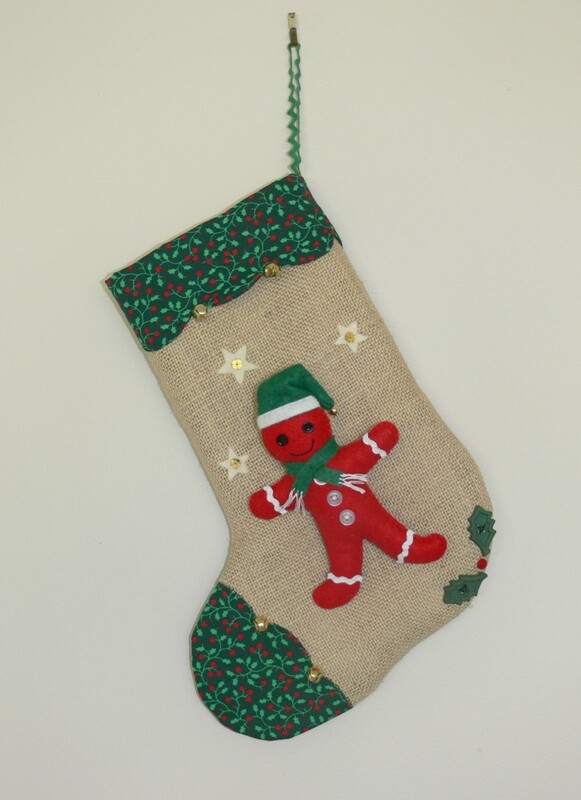 "All the stockings were hung" is my first ever Christmas Stocking design. While I've made a number of stockings for grandchildren in the past, I've never come up with my own original design till now. I wanted the embellishments to be three dimensional, and they ended up coming right "off the page". The angel and the gingerbread man are removable and wearable as a brooch or pinned to a bag or however you like to use them during the lead up to Christmas. Christmas Eve they can be pinned back onto the stocking ready for the big event! 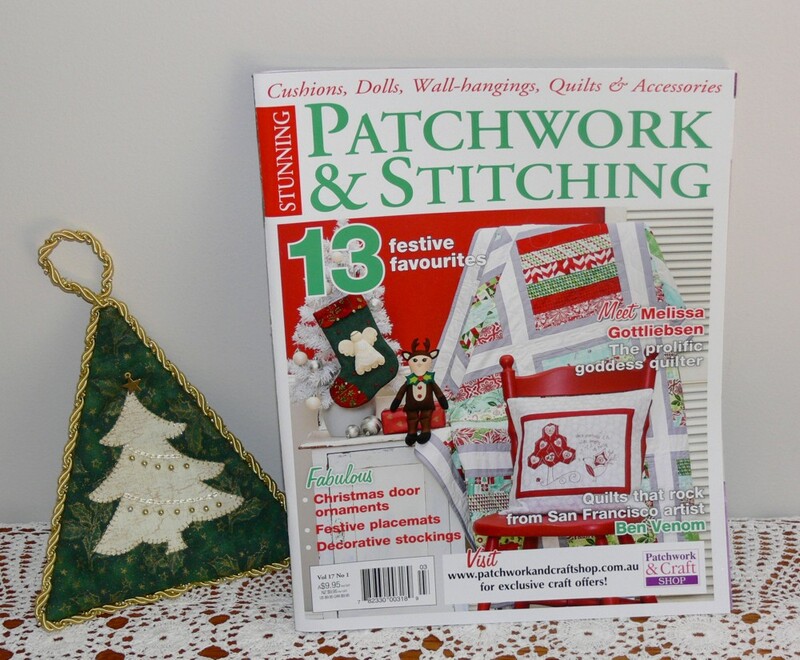 They have been published in Patchwork & Stitching Magazine, Vol 17 No 1. 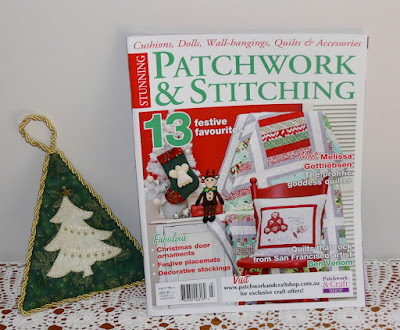 I do plan to put the pattern in my Craftsy store early December if you are unable to source the magazine and want to make these gorgeous stockings. The gingerbread man is just the cutest! I've been trying to make a few more of my patterns available in the store, seeing so many of you tell me that you can't buy our wonderful Australian magazines where you live. Polly finds the Holly oven mitt and trivet set is now available here. After not ever doing much Christmas sewing previously, I have a little collection of designs now. You can see them on my Christmas page. It had been very creatively put together. Once we arrived back home, the number one focus has been to prepare kits for a workshop I will be teaching in early December. Sure takes time to cut all the fabric, batting, fusible web and package all the embellishments! 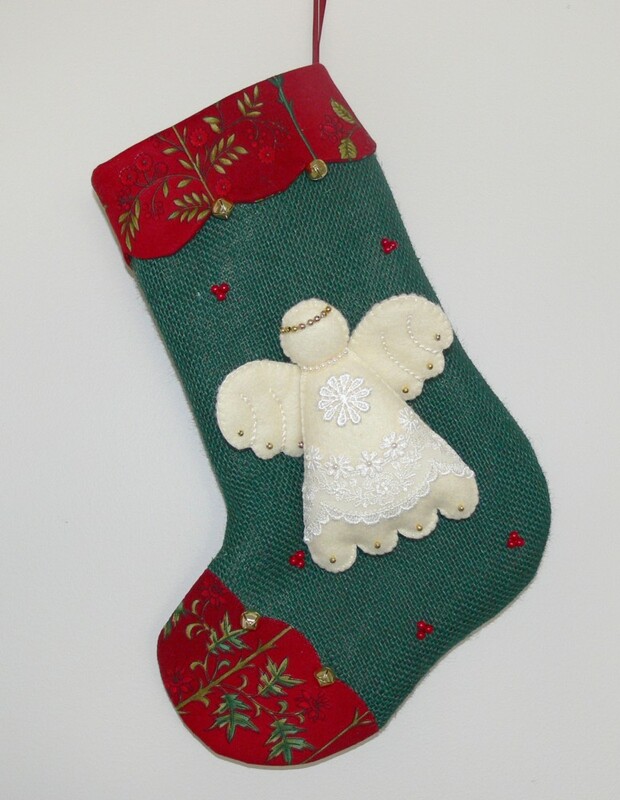 Val, love the Angel Stocking and what a great idea to be able to use on a coat or where ever else you might like. Just Love It!! I love the stockings and I'm so glad you're going to offer them. Thank you. I like the gingerbread man best, and I love the idea that these can be taken off and worn as a broach! That is quite an amazing yarn bombing. I've never seen one in person, and I would dearly love to. Love the yarn bombing! Another lot of lovely Christmas projects you have created.